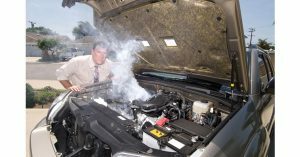 Hot weather is actually the most common cause of an overheated engine, according to the book, “Auto Repair for Dummies.” While it’s less common for modern vehicles to overheat, it is still possible. If your engine starts to get hot, it could be a sign that the water and coolant levels in your radiator might be too low. It could also mean that there’s a leak in your cooling system. You should monitor your vehicle’s temperature gauge to see if it’s running high. If you find signs that your car is overheating, the first thing you should do is shut off the air-conditioning and open your window, according to “Auto Repair for Dummies.” This lowers the stress on your engine. If the overheating continues, turn on your car’s heater and blower. This will transfer heat from the engine into your car’s cabin. If you’re in stop and go traffic, try not to ride on the brake, just creep along slowly so your engine won’t idle. If you have to stop, put your engine in neutral or park and then rev it. This will speed up your vehicle’s water pump and fan, circulating cooler air. If you think your engine is about to boil over, then it’s time to get off the road. Make sure you do this safely. The National Safety Council reminds you to carefully drive off to the right shoulder of the road. Don’t brake suddenly and signal your intentions to the drivers behind you. If you’re on the highway you should try to reach an exit if you can, but don’t sacrifice safety. Then make sure your car is visible. If you have reflective triangles, put them behind your vehicle to alert other drivers. Turn on your emergency flashers. And if it’s dark, turn on your car’s interior dome light. Once you’ve pulled over safely, you can start to address the overheating engine. The National Safety Council’s guidelines strongly suggest that you don’t open your car’s hood until it has completely cooled down. Make sure your temperature gauge reflects this. It’s probably a good idea to call a tow truck and get your car to a mechanic at this point. If you do attempt to work on the car, you need to wait for the engine to cool down. Do not open the radiator cap until it’s completely cool. Your car’s radiator is a pressurized system and taking off the cap can cause serious burns. If you eventually do open the radiator cap, slowly twist it off with a towel and watch out for any hot steam. Check your coolant levels and if you need to, fill it to the top of the radiator. Make sure you put the radiator cap back on. Check the radiator hoses for leaks or blockages. If you’re not certain your car is safe, Elite Towing & Transport Inc. of Long Island can tow it to your mechanic or a safer area. 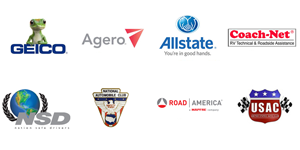 We offer roadside assistance when you’re in a jam, and we’re open 24 hours a day. To learn more, contact us today!